A rite of passage in every Hindu man’s life is the donning of the “sacred thread” or “Janai” in Nepali. Once donned, the Hindu in question will be regarded as having achieved majority and assumes his place within his caste, empowered to carry out religious rituals, marry, mourn the passing of a family member, etc. Every year, on the full moon “Purnima”, falling within the fourth month of the Hindu lunar calendar the thread must be ritually changed. Apart from the men who have donned the sacred thread others will wear a bright pink or saffron colored thread around their wrists amid the chanting of Vedic hymns. The festival is especially marked at the lake of Gosainkunda within the Langtang National Park and at MahadevPokhariin Nagarkotwhere, apprentice shamans gather with their teachers at a “graduation ceremony” and devotees of Lord Shiva of the Hindu Trinity gather to ritually cleanse themsleves. 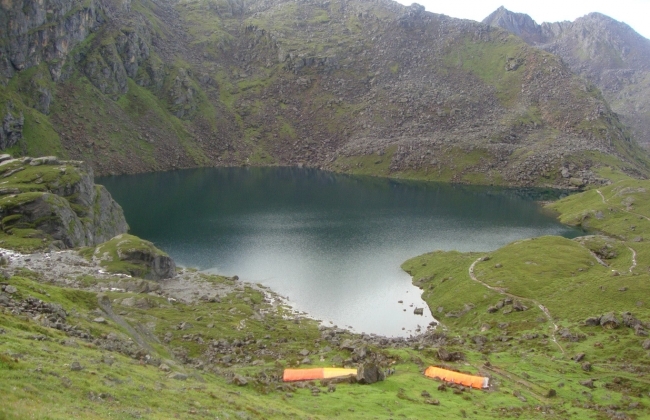 GosainKunda is the spot where in Hindu Mythology, Lord Shiva having consumed all of the poison destined to destroy all of mankind, is said to have struck his trident or “Trishul” into the ground to bring forth water whereby he slaked his thirst. The day is further observed by consuming “Kwanti”, a soup prepared by cooking nine types of bean sprouts. Two trips make viewing this unique festival possible: A trek to Gosaikunda Lake, due northwest of Kahtmandu via the Langtang Valley in August presents you with the opportunity to trek during the rainy season when the hills are at their most verdant, although the trails can be wet and at times, slippery. The high point of this trek will be the full moon night at Gosaikunda when devotees gather at the lake to partake in ritual bathing and the apprentice shamans show off their skills at their graduation event. Day 02 Last minute preparations for your trek or if you are feel you are sufficiently prepared then sightseeing of Patan Durbar Square, Swoyambhunath and Bodhnath. Day 06 Trek to Kyangin Gompa ((3870 m.
Day 09 Trek to Thulo Syabru (2230 m.
Day 13 Trek over the Laurebina La (4610 m.) and down to Ghopte (3440 m.). Day 14 Trek to Kutumb Sang (2470 m.). Day 17 Spare day in Kathmandu to allow for delays during your trek. Day 18 At an appointed time, transfer to the airport for your departure from Nepal.